OTOVENT is a front-line alternative for the treatment of negative pressure in the middle ear in children and adults. Regulation of the pressure in the middle ear is a known and important mechanism in the treatment of disorders of the middle ear in children. Normally, the pressure in the middle ear is equalized by swallowing or yawning. If the mechanisms for regulating negative pressure are not wholly effective, negative pressure in the middle ear occurs due to collection and absorption of the air in the membranous lining of the middle ear. After a number of weeks gluey secretions develop, filling the middle ear (glue ear) and leading to hearing impairment. Untreated it may lead to deterioration in the elasticity of the eardrum, which may lead to chronic disorders of the middle ear in the future. The Otovent-method is well proven first-line treatment in attempting to avoid surgical intervention with the insertion of a plastic "grommet"in the eardrum. The Otovent method can be divided into two phases, both phases allow the opening of the Eustachian tube. (To be used only if the inflation phase is ineffective): when you let the air flow from the balloon into your nostril and perform a sequence of swallowing manoeuvres. You are recommended to use the inflation phase the first few times you use Otovent. However, only in the event that you do not feel any pressure equalization as a result of the inflation phase should you use both phases. Adults and children ages 3 years and up. The treatment of children should always be supervised by an adult. 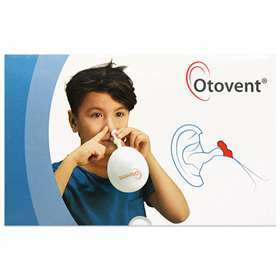 Initially, Otovent should be used at least three times a day (morning, noon and evening). After one week, it should be used at least twice a day (morning and evening). The normal duration of treatment is 2-3 weeks, after which a physician should decide whether or not to continue with the treatment. Each medical balloon may be inflated a maximum of 20 times. Connect the balloon to the nose piece. Hold the round part of the nose piece firmly against your right nostril with your right hand. Press your left nostril closed, using the fingers of your left hand. Inhale deeply and close your mouth. Inflate the balloon until it is the size of a grapefruit, by blowing through your right nostril. Repeat the procedure with your left nostril. Some patients may experience discomfort in the ear or dizziness during inflation. This initial sensation will decrease during next inflation and is an indication that the procedure is working correctly. If you do not feel anything in your ear, repeat step 2 but tilt your head forward and then to the right, then repeat step 3. (To be used only if the inflation phase is ineffective). A. Perform a sequence of swallowing manoeuvres (do not swallow the air from the balloon). B. Repeat the above steps with your left nostril. Clean the nose piece with mild detergent after use. Rinse the nose piece with clean water. Discard used balloons when they have been used 20 times. When not in use, protect the nose piece and the balloons against light, keep in the box provided.